On Friday, Contracts for Java was announced on the Google Open Source Blog. Learning about this at the beginning of the weekend was perfect timing for me: I had time to check it out, and while setting it up was some work, I was hooked right away. Now something like Contracts for Java is only really useful if it is well integrated into the tools you use everyday - which in my case is Eclipse. Eclipse allows many levels of integration, and I quickly had it working by running javac as an external tool - which is OK, but not ideal, since it requires running the tool manually after every change to the annotations, and doesn't give in-place error messages. I quickly found out Eclipse has support for custom annotation processing. 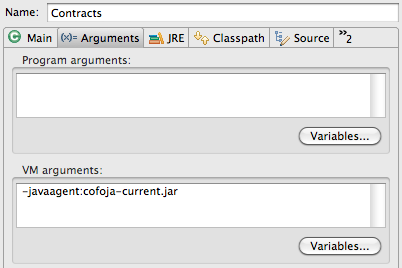 I had to fiddle a little until I got that configured properly with Contracts for Java so I thought I do a quick write-up so other people can try this cool new tool in Eclipse. After fixing our implementation to return a + b; the code now runs without errors. 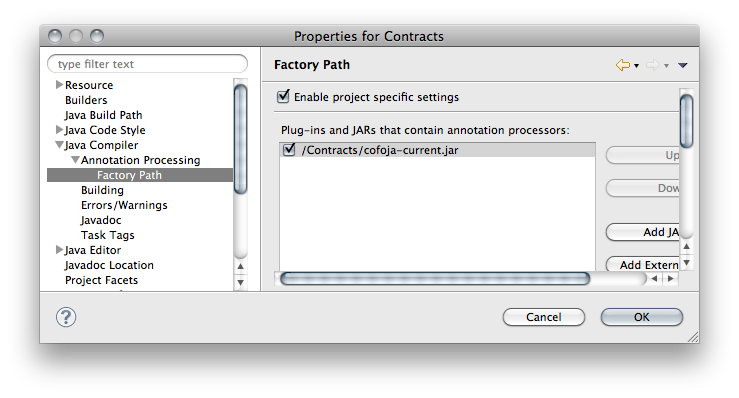 For further information on using Contracts for Java check out the project wiki. General information on design by contract can be found elsewhere.